The Weather Channel is celebrating creatures of all types this week! Today’s focus is all about alligators, bears, and coyotes. Tune in to The Weather Channel every day starting at 6 AM on AMHQ and check back here every day for new Creature Week stories we guarantee you’ll love. Dorothy didn’t run into alligators, bears, and coyotes on the yellow brick road, but they still exist! Running into these animals can be very scary! Making sure you know what to do is a must. You are most likely going to see alligators in Florida and Louisiana, where they live in rivers, lakes, ponds, swamps, bayous, and marshes. Unlike (some) humans, they’re clumsy on land but they rule the waters. Florida alone is home to an estimated 1.3 million gators. They grow to an average adult size of eight feet for female alligators and 11 feet for males, according to the Smithsonian National Zoological Park. 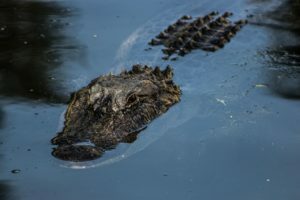 Because alligators will eat anything that is remotely close to fitting in their mouth- fish, turtles, frogs, and small mammals- it’s important to be prepared. If you find yourself encountering a gator, follow these tips. They just might save your life! Run. Remember the longer you stay in their territory (in or near water), the longer they will chase you. Forget the zigzag method you learned as a kid! Run as fast as you can in a straight line. Fight back. Let’s say you didn’t follow tip #1 and now you find yourself being held in the teeth of a gator. Fight like hell! The gator just might give up. Note: this is one of few times you want to feel unworthy. Gouge the eyes. It’s easier said than done, but it’s worth a shot. They might release you just long enough for you to swim away. Experts say the key when fending off an alligator is to keep them from rolling and dragging you underwater. To avoid an attack altogether, wildlife experts have one rule: do not feed them. 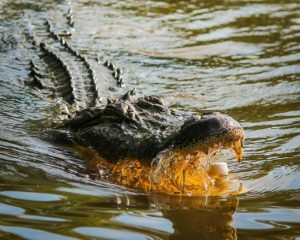 As exhilarating as feeding an alligator may be, you’re putting yourself in unnecessary danger (and it’s illegal so, yeah). Now that you know what to do in case of a run-in with an alligator, let’s move on to bears! Your first instinct is to run, right? Wrong! Depending on the type of bear, there are different actions you can take. Just remain calm and follow these tips. Try to identify the type of bear. Click here to see how to tell bears apart. Get your bear spray ready (yes, that’s a thing) and don’t make any quick movements. If you’re a safe distance away, back away slowly. Remember to keep your eye on the bear to see how it will react. 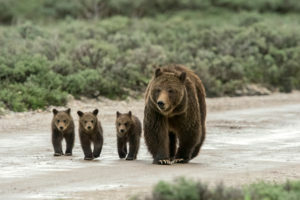 If a bear is acting defensively, such as a mother with cubs close by, make yourself as nonthreatening as possible. If none of these tips work and the bear makes physical contact with you, fall to the ground and play dead. 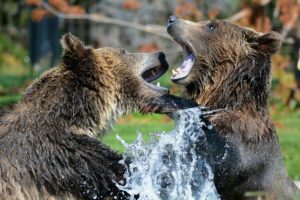 If the attack is prolonged and the bear continues to be physical, tips 1-5 are no longer useful. It’s time to fight back! Last, but not least, are coyotes. 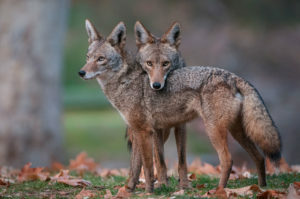 Coyotes are most frequently seen and heard January through March, which is their mating season. Engage in “hazing.” Hazing applies to actions people can take to scare a coyote away. These include being as big and as loud as possible, banging pots or pans to make loud noises, and throwing small stones and other items (Note your intent is to scare, not injure). If hazing does not work, do not run away and do not turn your back. Continue to stand tall and look the coyote in the eyes. Back away slowly, always keeping your eyes on the coyote. If all else fails and the coyote attacks, protect your throat and other areas that are vulnerable to serious injury. As mentioned earlier, coyote attacks on humans are extremely rare. With all of these animals, it’s most important that you stay calm. Their size can be intimidating, but making sure you know what to do if you’re ever in one of these dangerous situations is essential. We had 8 years of gators in the Whitehouse. They would hide underwater and push things thru under executive orders. In most they were not good for most of us. They would snap and charge anyone who disagreed with them. We have to pass it to see what’s in it. It was surprising at the time how the Weather Channel, under NBC control was pro gator. Always showing the Whitehouse background. Pushing it’s agendas. That gator needed to be dragged back to Kenya, where it came from. It’s the only time a gator and a gorilla were mating together.